SAN ANTONIO, Texas – July 24, 2016 – Today, San Antonio Express News released the winners of its annual Reader’s Choice Awards, and Pizza Patrón, widely known for its PIZZA POR PESOS® program, was voted “Best Pizza-Chain” in San Antonio. The contest was open for voting from April 23 through June 21st this year, and despite not being a nominee on the ballot, Pizza Patrón was catapulted to first place, the “Gold Award”, by its fans throughout the city. The San Antonio Express News accepts votes cast via text, mail and online. “We are so appreciative of our customers who took the time and effort to vote for us, giving us the first place honor over the three companies on the ballot: Papa John’s, Pizza Hut and Grimaldi’s,” said Stephanie Yzaguirre, director of Marketing for San Antonio Pizza LLC, the Pizza Patrón franchisee group. Pizza Patrón makes its signature dough from scratch in each store daily. It is naturally fermented to its peak state of proofing and flavor. After baking, each pizza features a crispy crust that combines with a tender, springy crumb and retains just a hint of sour that brings out the rich and complex essence of the grains. The sauce starts with fresh-packed, crushed Roma tomatoes and marinates for 24 hours with the company’s secret blend of spices and herbs before it is served. San Antonio Pizza LLC has 11 Pizza Patrón locations in San Antonio. To find a store, visit www.pizzapatron.com. For franchise opportunity information, please contact franchise sales manager Isaiah Melendez directly at 972-982-0176 or visit ownapizzapatrón.com. 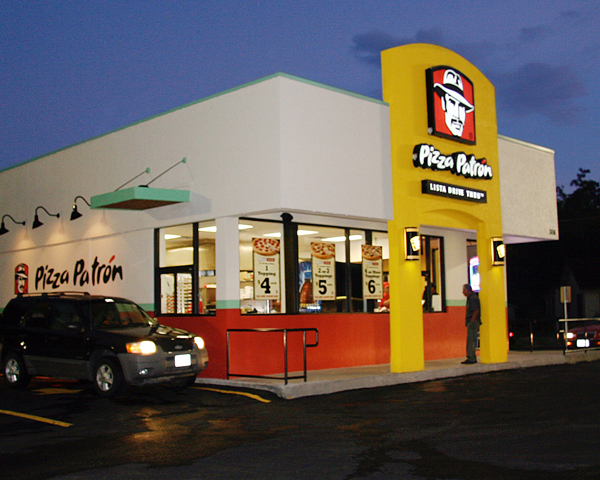 Since 1986, Pizza Patrón has been committed to making its promise of “Más Pizza. Menos Dinero.®” a reality for every customer. From the beginning, the brand has been recognized for its ‘fresh-dough’ pizza, its low prices and its trademark “friendly, bicultural service.” In 2007, the company drew international media attention with its PIZZA POR PESOS® program when it began accepting Mexican Pesos at all of its restaurants. In 2012, the company’s PIZZA POR FAVOR™ promotion that gave free pizzas to anyone who ordered in Spanish sparked international news coverage and lively debate throughout the U.S. Today, Pizza Patrón is the leading Mexican pizza brand in the U.S. and remains dedicated to bringing its unique experience to life with every pizza made, and in every community it serves.